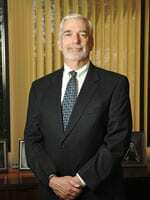 JOHN C. RICHARDSON is a Shareholder with the Tucson office. For the past thirty years, his practice has emphasized employment and education law. Mr. Richardson represents numerous public school districts and community colleges, as well as non-profit and for-profit corporations. On a day-to-day basis, he serves as legal counsel for employers that employ over 5,000 employees in Southern Arizona. While the emphasis of his practice is on preventing and conciliating disputes, Mr. Richardson has frequently been involved in litigation concerning employment and education issues, including an appeal argued to the United States Supreme Court. He earned a B.S. with high distinction in Electrical Engineering from the University of Arizona. He earned his J.D. from the University of Arizona College of Law where he graduated first in his class. Mr. Richardson was admitted to the Arizona Bar in 1978 and before the U.S. Supreme Court in 1983. He is a member of the Arizona Council of School Attorneys and the Employment Practice Section of the State Bar of Arizona. Mr. Richardson serves on the Board of Directors of, and is past President of, Comstock Children’s Foundation, Inc., which provides medical supplies and services to children who cannot otherwise afford such services and supplies.